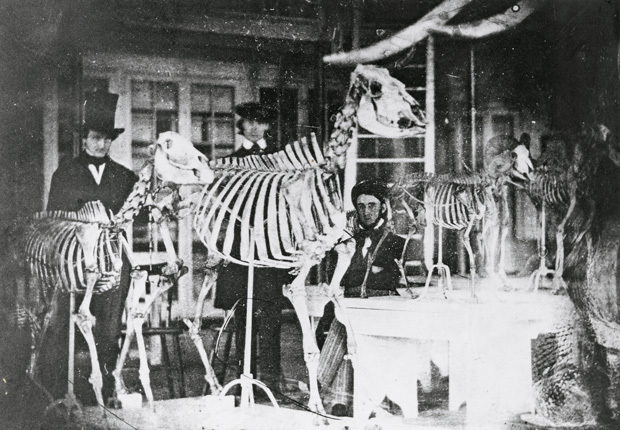 This 1842-43 daguerreotype is the oldest known view of the interior of an American Museum, in this case, the The Academy of Natural Sciences of Philadelphia. 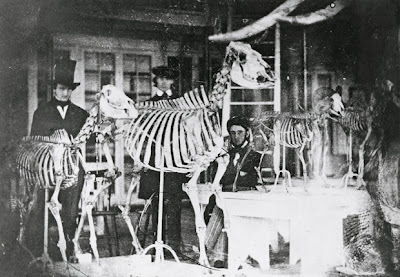 More remarkable, the photo shows Samuel G. Morton, Joseph Leidy, and Edgar Allan Poe, who studied mollusks at the academy. It was by his [Dr. Ponnonner] advice, accordingly, that we made, upon the spot, a profound incision into the tip of the subject's nose, while the Doctor himself, laying violent hands upon it, pulled it into vehement contact with the wire. ....I may as well take this occasion to remark, that all the subsequent conversation in which the Mummy took a part, was carried on in primitive Egyptian, through the medium (so far as concerned myself and other untravelled members of the company)–through the medium, I say, of Messieurs Gliddon and Buckingham, as interpreters. These gentlemen spoke the mother tongue of the Mummy with inimitable fluency and grace; but I could not help observing that (owing, no doubt, to the introduction of images entirely modern, and, of course, entirely novel to the stranger) the two travellers were reduced, occasionally, to the employment of sensible forms for the purpose of conveying a particular meaning. Mr. Gliddon, at one period, for example, could not make the Egyptian comprehend the term "politics," until he sketched upon the wall, with a bit of charcoal a little carbuncle-nosed gentleman, out at elbows, standing upon a stump, with his left leg drawn back, right arm thrown forward, with his fist shut, the eyes rolled up toward Heaven, and the mouth open at an angle of ninety degrees. Just in the same way Mr. Buckingham failed to convey the absolutely modern idea "wig," until (at Doctor Ponnonner's suggestion) he grew very pale in the face, and consented to take off his own. It will be readily understood that Mr. Gliddon's discourse turned chiefly upon the vast benefits accruing to science from the unrolling and disembowelling of mummies; apologizing, upon this score, for any disturbance that might have been occasioned him, in particular, the individual Mummy called Allamistakeo; and concluding with a mere hint (for it could scarcely be considered more) that, as these little matters were now explained, it might be as well to proceed with the investigation intended. Here Doctor Ponnonner made ready his instruments. In regard to the latter suggestions of the orator, it appears that Allamistakeo had certain scruples of conscience, the nature of which I did not distinctly learn; but he expressed himself satisfied with the apologies tendered, and, getting down from the table, shook hands with the company all round." Comment II on “Gould versus Morton”: Morton’s Crania Collection in the Context of the Final Decades of Natural History, Part One.